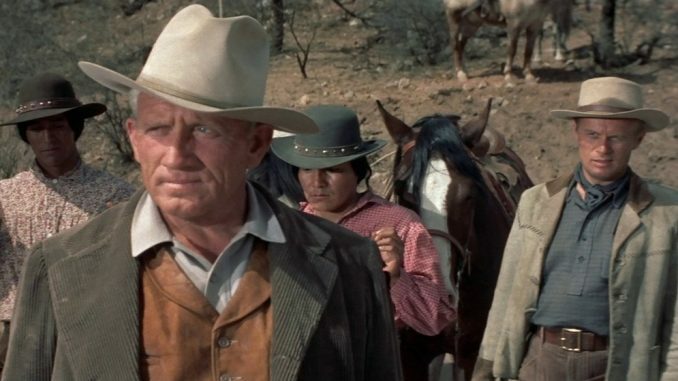 At the heart of Edward Dmytryk’s sweeping Western Broken Lance is a simple quiet scene of near overwhelming power. 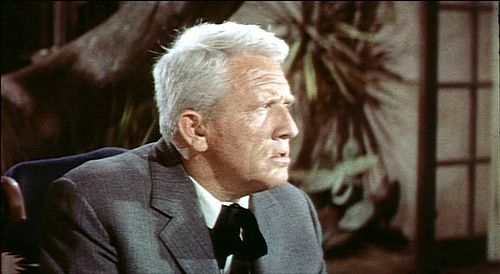 Tyrannical cattle rancher Matt Devereaux (Spencer Tracy) and his four sons confront the owner of a copper mine whose toxic river runoff has killed dozens of their herd. Threatening a court order and injunction, the five ranchers turn to their horses to leave. But at the same time the miners, whose well-being has just been threatened, begin to follow them en masse. Slowly, ever so slowly, this silent wave of humanity bares down on them. “Get ‘em, boys,” the mine headman screeches. Of course, a veritable cavalry of cowboys appears and rushes to Matt’s aid in the nick of time, burning the mill to the ground. But despite this stunning spectacle of destruction, it was the slow desperate approach of desperate men which sears into our minds. Here we find the film’s central idea: the inevitability of fate, unstoppable and non-negotiable. The Devereaux ranch is doomed, not just by the spread of industrialization and mineral rights, but by Matt’s own hubris. A remake of Joseph L. Mankiewicz’s superb House of Strangers (1949)—itself a loose adaptation of Shakespeare’s King Lear—Broken Lance is a film of a house divided against itself by a tyrannical, oblivious patriarch. In time, Matt will find himself completely at odds with his eldest three sons—children of his first wife—who after years of virtual indentured servitude have grown to hate him. Only his beloved fourth son Joe (Robert Wagner), child of his Native American second wife, remains loyal. But he bears a twin stigma: “polite society” considers him a half-breed; his brothers consider him a pampered, spoiled daddy’s boy. As must happen in the Old West, a reckoning beckons. The on-location CinemaScope shooting helps accentuate the film’s bombastic Shakespearean undercurrents. 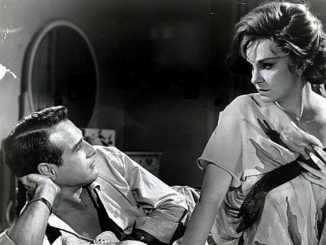 Cinematographer Joe MacDonald took to the anamorphic format like a fish to water, transforming the sun-scorched wastes of the Arizonian countryside into a seemingly endless stage for machismo melodrama. But MacDonald’s meticulously constructed frames do remarkable justice to intimate interiors as well. Two of the best scenes of the movie—Matt’s testimony during his trial for destroying the mine and a climactic confrontation between him and his vengeful, emotionally-wounded son Ben (Richard Widmark)—are captured in static two-shots which linger for several minutes without any edits. Dmytryk understood that despite the film’s pictorial exteriors, Broken Lance depended on the power of its emotional interiors. The film features shockingly little physical violence: including the raid on the mine camp, there are probably only three brief action set-pieces. But the expertly performed duel of wills between Tracy, Widmark, and Wagner are magnificent. 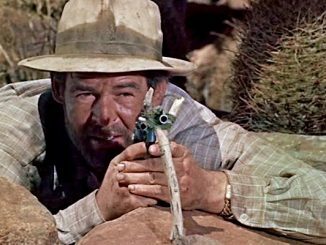 Tracy in particular gives a ferocious late career performance, starkly reminding us of his ability to switch wildly (and convincingly) between several disparate emotions within the space of a single shot. My copy of the film was the new Twilight Time release and it more than continues the brand’s tradition of quality Blu-Ray releases…as well as hit-or-miss special features. This particular release is an unfortunate miss: though the commentary track featuring actor Earl Holliman (Denny Devereaux) and film historian Nick Redman is a welcome addition, the other extras are laughably simple. My favorite was the Fox Movietone Newsreel. Expecting to see the complete newsreel that accompanied the film’s original release—something which I have seen on other classic Hollywood DVD releases—I was amused to discover a short 30-second or so clip of footage from the 27th Academy Award ceremony where a narrator mentioned how Broken Lance took home the Oscar for Best Story before cutting to a lengthy shot of Marlon Brando accepting the award for Best Actor. Broken Lance is available as a limited edition blu-ray exclusively through Twilight Time.